Relay for line control - 3 output relays with 250 VAC/5 A CO contacts. Control the condition of the line between the control circuit (dry contact type) and the control device. * 1 line contact putting off. 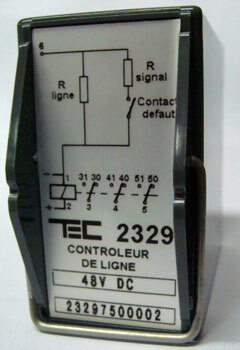 The relay used for default type indication and contact position checks permanently the line impedance between terminals n° 1 and 6.. The line impedance to control must be less than 3000 Ohms.